IPhT is located 20km south-west of Paris, in a place called Orme des Merisiers (see map). From Paris or Charles-de-Gaulle airport (or Orly airport via Orlyval and Antony station), take the train RER B direction Saint-Remy-les-Chevreuse. The simplest and fastest is to take a train to Le Guichet (approx. 35 minutes from Paris, 1h15 from Charles-de-Gaulle, make sure your train stops there). Off at Le Guichet, take the pedestrian underpass at the front of the train. Turn right after the café and cross the street. A pedestrian way on the left leads to the bus station. Bus 9 (the default bus at this station) leaves every 5' at rush hours (every 15' off peak), and reaches Orme des Merisiers in 8'. This bus is free with a weekly or monthly pass "Navigo"; otherwise, tickets are 2 euros if purchased on the bus, 1.5 euro if you buy 10 at a time from the vending machine in the train station (carnet 10 tickets t+). The second option is to take the train RER-B to Massy-Palaiseau (approx. 25 minutes from Paris, 1h05 from Charles-de-Gaulle) and take bus 91.06B, 91.06C or 91.10 which reach Orme des Merisiers in 20-25 minutes. This is usually slower (by 5' to 10') than going through Le Guichet. Exit the bus at Orme des Merisiers. There is a gate for pedestrian access right in front of the bus stop. After the gate, go right. Once you reach the road, go left. IPhT is building 774 at the end of the road on the right side (approx. 10 minute walk from the bus stop). If you already have a CEA access card (show it to the driver once you get on the shuttle), you can take shuttles from the Porte d'Orléans bus station. Departure at 7:15 am, 7:35 am, 7:50 am, 8 am, 8:10 am, 8:20 am, 8:30 am, 8:45 am and 9:10 am. Get down at the station Orme/Synchrotron Soleil, at the traffic roundabout in front of the entrance of the Orme des Merisiers. The arriving times are respectively 8:03 am, 8:23 am, 8:38 am, 8:48 am, 8:58 am, 9:08 am, 9:18 am, 9:33 am and 9:58 am. Determine the best route via your preferred app. Our Institute is referenced as IPhT Saclay on google maps. 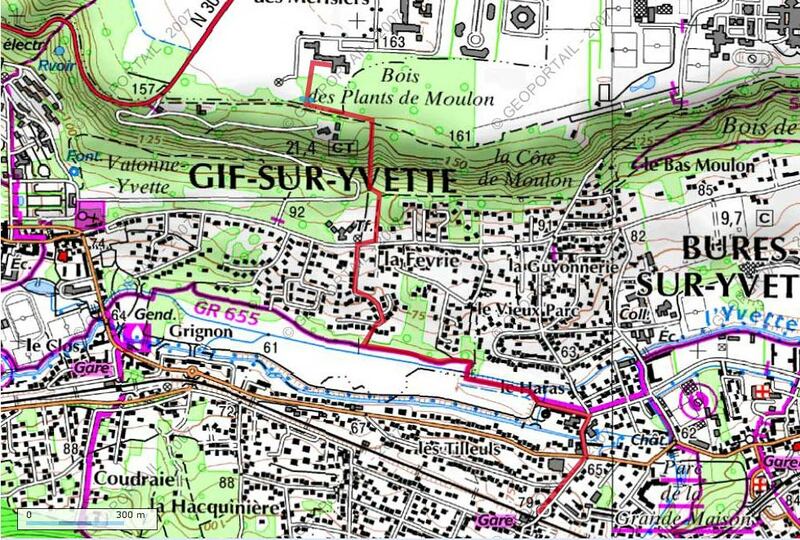 You can reach IPhT directly by walking from the train stations of La Hacquinière or Gif-sur-Yvette on RER B. This requires both a valid access badge to Saclay and a good knowledge of the neighborhood. But the gate beside the swivel is generally open during the business hours. It is not a valid option on your first visit. The walk includes a steep forest path uphill, which can be very muddy, thus take good shoes. It takes about 30 minutes for an experienced hiker to reach IPhT from La Hacquinière (see map).